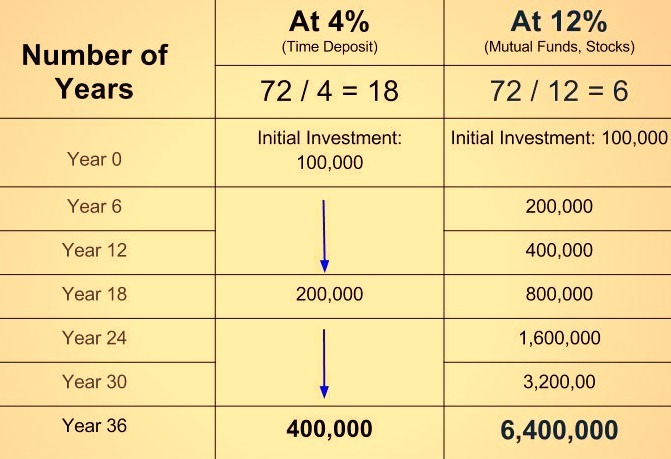 Rule of 72 is a simplified application of compounding principles. It is a tool to estimate when your money will double. This can help you choose from alternative investment vehicles to achieve your financial goals. 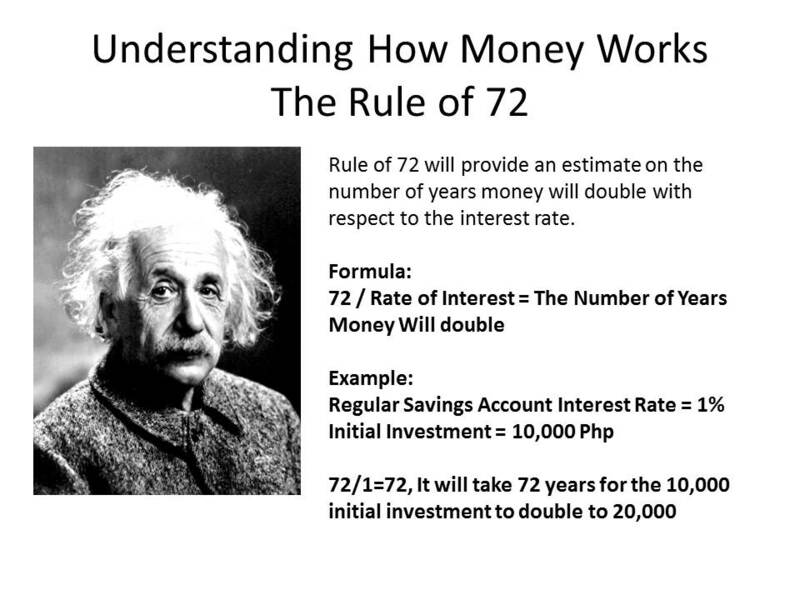 Discovered by Albert Einstein, the rule of 72 is a powerful tool to determine what kind of saving and investment vehicle works for you taking into consideration your budget and your target period to double your money. Suppose you start out at age 29 with an initial investment of PhP100,000.00. At 4% interest money doubling time is 18 years so when you reach 47 (29+18) years old your money becomes PhP200,000. In the next 18 years when you reach retirement at age 65 your money will double to 400,000. At 12% interest, with your money doubling every six years, you will end up with PhP6.4 million in Year 36 or by the time you reach 65. In other words, the lower the interest rate, the longer the time you double your money. If you keep your money in a savings account, it will earn less than one percent annually. Applying the rule of 72, it is financially sound to put your money somewhere else such as in stock investment or in mutual funds. Keeping your money in banks may have very low risk but the rewards are also low. Most banks offer less than one percent per interest for regular savings account and just a little bit higher for time deposits and special accounts; and a 20% tax is deducted from your earned interest. Further, with inflation rate higher than interest rate, you are a sure loser. Start inventing now. Investments provide a more rewarding avenue for growing your money. Depending on the choice of investments, the risks ranges from low to very high. It is said that one of the greatest investment risk is the risk of doing nothing and missing the opportunity of a superior return. The Kaiser Premium Health Builder, a long term health care plan, is also an investment product. Your unused health care benefits will grow at prevailing market rates of interest but in no case lower than 7%. If the prevailing market rate of interest is 10%, your health care savings with Kaiser will approximately double every seven years, applying the rule of 72.